Orbs of Eternity is an iPhone game from developer Breathing Bytes. 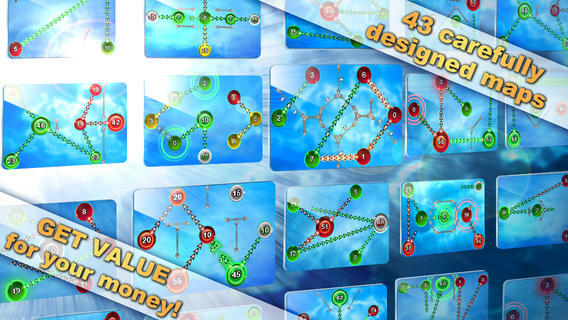 The game begins with a series of tutorials which show you how to play Orbs of Eternity. Essentially, the green orbs are yours, the reds orb are the enemy and the object of the game is to take over the enemy’s orbs until you control them all. 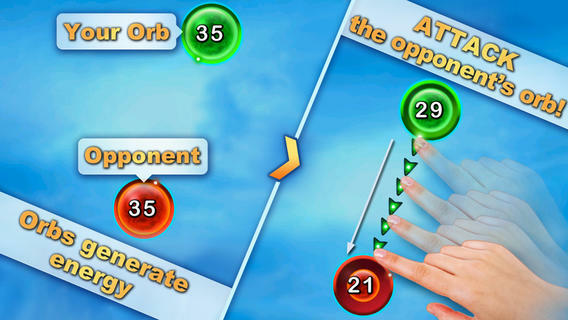 To attack an opponent you tap and hold on your orb and drag a straight line to your opponent’s orb. This creates a ‘beam of energy’ which will reduce the level of energy in the opponent’s orb. Once it reaches zero, you’ll gain control over it and the orb will turn green. Beware though, as the beam leaves your orb it takes energy with it. 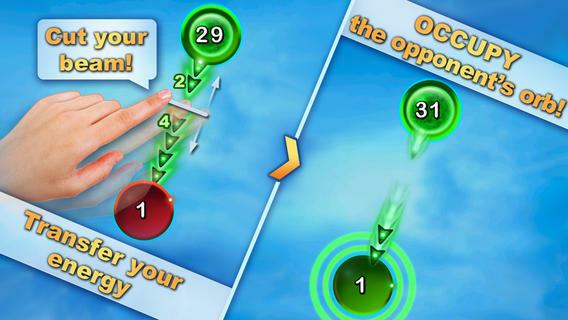 You can also ‘cut the beam’ by swiping with your finger to send a more precise attack. As a rule, orbs generate energy until they’re full. And the closer to full the are, the faster they regenerate. You can use multiple orbs of your own to attack a single enemy orb or transfer energy from several of your ‘lower’ orbs, to create a more powerful one. There are 43 original stages in all as well as multiple difficulty levels that cater for both the casual gamer and those who love a challenge. As you progress through the game, you encounter multiple opponents and obstacles such as walls which you need to work around. I found the gameplay in Orbs of Eternity to be surprisingly engaging and addictive. The concepts are simple to master but the game becomes more and more challenging as you move through the maps and up the difficulty levels. Orbs of Eternity features simple, but effective visuals and a fun arcade play-style. Well worth a look for just $1.99 on the App Store. Orbs of Eternity requires iOS 5.0 or later. Follow Tapscape for all the best iPhone game reviews.